It’s a big day for Samus Aran. In addition to Metroid Prime 4 on Switch, Nintendo announced today a sidescrolling game for 3DS called Metroid: Samus Returns. This is a “reimagination” of the Game Boy game Metroid II: Return of Samus, developed by MercurySteam, the studio behind the early 3DS game Castlevania: Lords of Shadow. It looks gorgeous. Metroid: Samus Returns will be out on September 15. Following the game’s announcement on Treehouse Live, Nintendo featured original Metroid co-director Yoshio Sakamoto as well as MercurySteam’s José Luis Márquez to talk about the game in-depth. Samus now has free-aiming; you can point her arm cannon with a full 360-degree range of motion. Samus has a Melee Counter: Right before an enemy charging at you hits your body, you can press X to knock them away and score a counter hit. “Aeion abilities” are a new feature not in the original, giving Samus different abilities that are not suit upgrades. They’re limited abilities that rely on an energy gauge. One, called “Scan Pulse,” lets you display more of the game’s mini-map in a small area around you, showing you where hidden pathways and items are. Like the original Game Boy game, you’re hunting down Metroids right from the get-go, and you have a Metroid detector to let you know they’re nearby. You can use “map pins” to remind yourself to visit a location later once you have a new ability. Metroid fights use the Melee Counter, too; the Alpha Metroid Samus goes up against has a highly-telegraphed charge slam that you can counter, to open him up for a damage opportunity. The game’s soundtrack is being composed by two of the composers from the SNES game Super Metroid. Going by the menu screen, it would seem as if there are 40 total Metroids (of different evolutions) scattered about the game for you to take down. Samus acquires the Spring Ball not by finding a statue, but by defeating an evolved Metroid. Samus Returns has “Teleport Stations” that let you fast travel between areas. Convenient! The Varia Suit is in the game, which helps you survive in “extreme heat.” You don’t even need authorization to put it on! You lose your Aeion Gauge when you get hit by enemies, too, so you have an extra incentive to fight enemies rather than just run through them taking damage. There are “audio cues” that let you know when to melee the Metroids, one of the Treehouse streamers says. You can use the grapple beam to rip enemies off the wall. “We really feel that the potential for the 2D Metroid franchise has really opened up for us,” Sakamoto says. The game will have a special edition with a reversible cover and a soundtrack with 25 tracks called “Samus Archives,” with tracks from many games including Samus Returns. 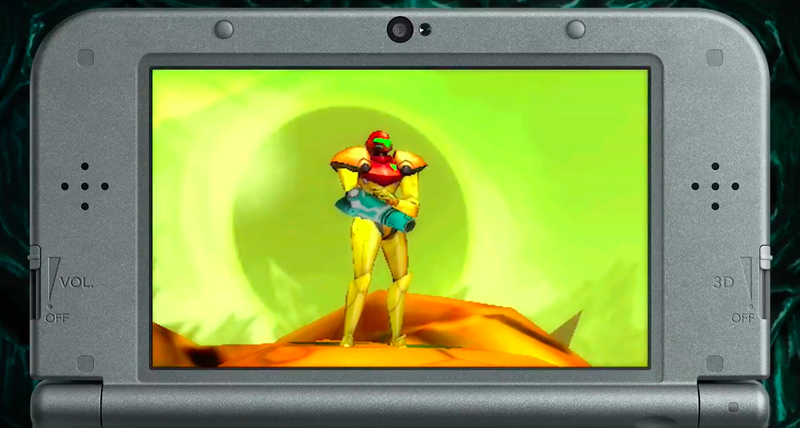 There will be two new Amiibos for the game: Samus in her pose from the Metroid II cover, and (finally!) a Metroid Amiibo. Kotaku features editor Chris Kohler contributed to this report.